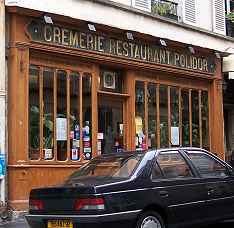 One of the main delights in Paris is the abundance of reasonably priced places to eat. Here are some of the places we've enjoyed. They are arranged in order of arrondissment. We have been to each of these places at least twice and thought they deserved inclusion. Opposite the Tuileries and the Louvre, just along from W H Smith's book and magazine shop, this is where you can get the very best hot chocolate I have ever tasted. But beware, only the very hungry can manage one of their superb cakes and hot chocolate too, so stick to a croissant instead. They do also serve good meals, but the hot chocolate is not to be missed, and it comes with whipped cream too, well it would wouldn't it! The chocolate comes in a jug and the cup is porcelain and looks deceptively tiny. If there are two of you you share the jug, but there is no need to be greedy, as you will struggle to finish it. If you have seen the film Something's Gotta Give with Jack Nicholson, Diane Keaton and Keanu Reeves, this is the restaurant where Diane Keaton's character says you can eat the best roast chicken in the world. Well the chicken is good, but I'm not sure it's the best, the restaurant is well worth a visit though, as it has the typical brasserie decoration. The waiters speak English, and there is an English menu. The rhum baba is superb. Lunch set menu of a starter and main, or main and sweet plus coffe costs 19 euros, and is well worth it. Also they have books of photographs that they will let you look though if you want. This place is a rare breed, it is most definitely a tourist attraction, but most of the customers are still locals. Let's hope it doesn't change. Pizzas are the specialty of this restaurant, though they do serve other dishes. The pizzas are huge and look home-made, and are around 8 euros. I don't know what the starters or desserts are as I've never managed to finish a pizza yet! The menu is in English, French and Italian. It is always busy at lunchtime, and sitting upstairs is best, though service is slower there. Open every day 11:30 - 00:00. This restaurant is just behind Notre Dame Cathedral, and is a perfect place to take visitors. They have a lunch time menu for around 30 euros and an evening menus for 39 and 50 euros, or you can order a la carte. The house was built in 1512, and there is not a straight line in the place. The waiters all speak some English. It is best to book for evenings, and sometimes for lunches too. All the produce comes from their own organic farm. For a really wonderful Parisian evening walk along the Seine after dinner, or if you dine early you could even take a boat down the Seine and see all of Paris lit up for you. French cuisine. Set menus from around 20 euros, and a la carte. Terrine St Jacques and courgettes for starters is excellent, in fact all the fishy things are very good. The lamb and duck are also highly recommended. Some English is spoken. Reservations are recommended as it is always busy. Open daily 19:30 - 00:00. Quaint little bistro since 1930, serving traditional family cuisine reminding you of home and grandmother's kitchen. Fixed price menu from 9-18 euros, as well as a la carte menu. Specialties include frosted cream desserts and fruit tarts, as well as soups, beef bourginion, kidneys, salmon and calamarie. Reservations not accepted, nor are credit cards. Open daily for lunch and dinner. This is a lovely little restaurant in a very historical part of Paris, if you have time have a look at the turret of No. 21. Now for the food. Firstly the bread, which you cut off of a huge loaf, and it is delicious, but don't eat too much or you won't have room for the food. During lunch there are two menus, one has starter and main or main and dessert plus a glass of wine for 14 euros, the other has starter, main, dessert and 250cc wine for 26 euros. There is also a dinner menu of 21 and 25 euros. The soup is superb and would make a meal on its own. The chou farci (stuffed cabbage) of salmon trout was excellent, as was the steak, I couldn't manage a sweet, but the apple pie was good so I'm told. They have a web site (http://www.lozere-a-paris.com/), all in French, but if you click on the menu page you should be able to understand most of it. Service is friendly, and a little English is understood. 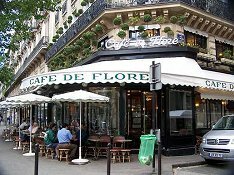 The Cafe de Flore, beloved by Jean-Paul Sartre and Simone de Beauvior, today it is touristy, but the first floor is still a wonderful place to escape the hustle and bustle of the street. Upstairs has been refurbished, and on a hot day it is delightful to sit and look out at the windows framed by banks of vegetation. Service is always slower upstairs, but the waiters usually speak English, and the toilets are good. So a nice place to recover from sightseeing or shopping and have a drink or lunch. They got so fed up of tourists trying to take away cups etc. that they've started to sell them. rue Cler has a very good fresh food market, and after shopping this is the best place to come for a very inexpensive lunch. Sit on the terrace and if it is warm have one of their huge salads, or if it is cold have the dish of the day or something off the menu. It is usually crowded both for lunches and dinners. They do have a small room at the back seating around 6 which you can reserve if you telephone. The house was built in 1640. 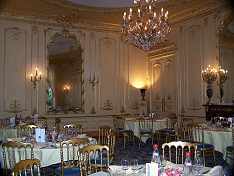 There are a number of beautiful rooms, and it depends on the size of your party which room you get. Reservations are a must, and they can cater for 4 - 200 people. The food is very good and typically French. The prices range from 36 euros to 120. This is an excellent place for a special occasion, as the setting is very elegant. And in summer, if you are in the Grand Salon or Quadrille Lounge you can also wander around or sit in the garden. American restaurant, bar and boutique, serving traditional American cuisine. Fajitas, hamburgers and fries, salads, steak, ribs, and a large selection of frozen drinks and hearty appetizers are the specialties. A la carte menu 15-25 euros. English spoken. Atmosphere is lively and entertaining, and it's a good place for kids. Open daily noon-1AM. If you like opera then this is the place for you. The staff are opera and music students, and take frequent breaks to sing operatic arias. The combination of wonderful sounds, delicious food and good wine combines to make a really great atmosphere. The food is mainly Italian, and there is a set menu for around 50 euros. 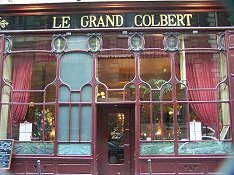 There is another restaurant near the Hotel de Ville and a web site www.lebelcanto.com Reservations are necessary. I haven't been here for a while (23/12/05) and I hear they have raised their prices quite a bit, but everything else is the same. This restaurant specializes in fish and sea food. There is no English menu and little English is spoken, but the staff are very nice and helpful, and the food is always superb. Around 25-30 euros. Reservations are necessary on Fridays and Saturdays. Closed Sunday all day and Saturday lunchtime. Spanish cuisine with specialties to include, calamarie, paella, gambas and parrilleda. Also sangria and wines from Spain. Main course 15-18 euros. Friendly service, French and Spanish spoken. Music on Friday and Saturday evenings. Reservations recommended. There are some very naughty/hilarious deserts based on parts of the anatomy. A small Italian restaurant with a three course evening menu for 15 euros! Pasta with salmon is very good as is the spicy tomato sauce. Fresh fruit salad is also good, but not always available. This is my local. Noisy, crowded, smoky, usually busy. Enormous salads, the Neptune is excellent, a mountain of smoked salmon, tuna, prawns and mussels surrounded by a sea of lettuce, and all for 9 euros. The croque madame (toasted bread cheese and ham topped with a fried egg) and frites at 7.5 euros is simply the best I've ever had (this is now called something else, but is just as good), the omelettes are huge and good too. Some English is spoken, and there is an English menu. Open every day from 6:00am - 2:00am, in fact I've never seen them closed. Traditional French cuisine since 1921. Large, open atmosphere with plants and lots of sunlight. Friendly, English speaking staff, as well as English menus. Fixed price menu from 10-20 euros, as well as a la carte menu. Specialties include canard, salmon, pork, and beef. Reservations recommended. Open daily for lunch and dinner. In summer they slide their roof open. A beautiful Indian restaurant with excellent food and so so service. There are set menus from 12 - 39 euros. We chose the 39 euros as we were hungry, and were presented with a huge array of dishes. If there are a few of you, and you are unsure of what to order I would recommend this as you can all have a taste of the different dishes. The cheese nans are hot from the ovens and delicious. There is the usual difficulty of what to drink with curry, they have a reasonable wine list, but I would recommend the Kingfisher beer (brewed under licence in England) and iced water. The only disappointment is the sweets, few of us had room for them, but the sorbet and ice cream were OK. Most of the waiters can speak some English. A very reasonably priced Italian restaurant with 12 and 17 euro menus. The pizzas are huge and very good. They also do pizzas and some pasta to take away. Some English is spoken, and the menu is in English and French. This is a good place to have lunch or dinner after visiting the Eiffel Tower. Quite simply the very best middle eastern food I've ever had. This place specialises in Syrian and Lebanese foods. When we go here we nearly always have the mezzes. That's a huge selection of starters, hot and cold, that just keep coming and coming. If you are not familiar with the cuisine then this is a very good introduction, or you could stick to the set menus. There is a set lunch menu for 15 euros. A la carte for lunch will come to 15 - 20 euros a head without wine. The house red wine is good. The staff don't speak much English, but they are very friendly and keen to help and explain the menu. This place gets quite busy and it is better to book for evenings, and to turn up early for lunch. The back room is more traditional and cozy.